Life's Journey To Perfection: LDS Sharing Time Ideas for April 2015 Week 1: Heavenly Father and Jesus Christ appeared to Joseph Smith. LDS Sharing Time Ideas for April 2015 Week 1: Heavenly Father and Jesus Christ appeared to Joseph Smith. April 2015 Scripture: “We believe in the same organization that existed in the Primitive Church” (Articles of Faith 1:6). 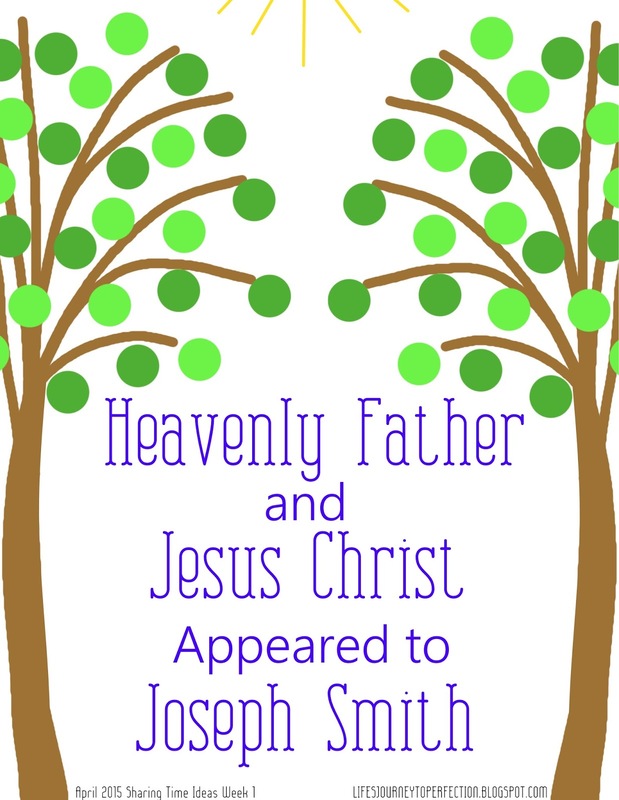 April Week 1 Topic: Heavenly Father and Jesus Christ appeared to Joseph Smith. Show a picture of the Savior and explain that when Jesus was on the earth, he created his church. Invite the children to repeat the 6th Article of Faith, "We believe in the same organization that existed in the Primitive Church, namely, apostles, prophets, pastors, teachers, evangelists, and so forth." Show a picture of the First Vision. Invite the children to help tell the story of the first vision with you. Here is a link to help in telling the story: The Testimony of the Prophet Joseph Smith. When Joseph Smith was 14 years old he was concerned with which church was true. So he prayed. 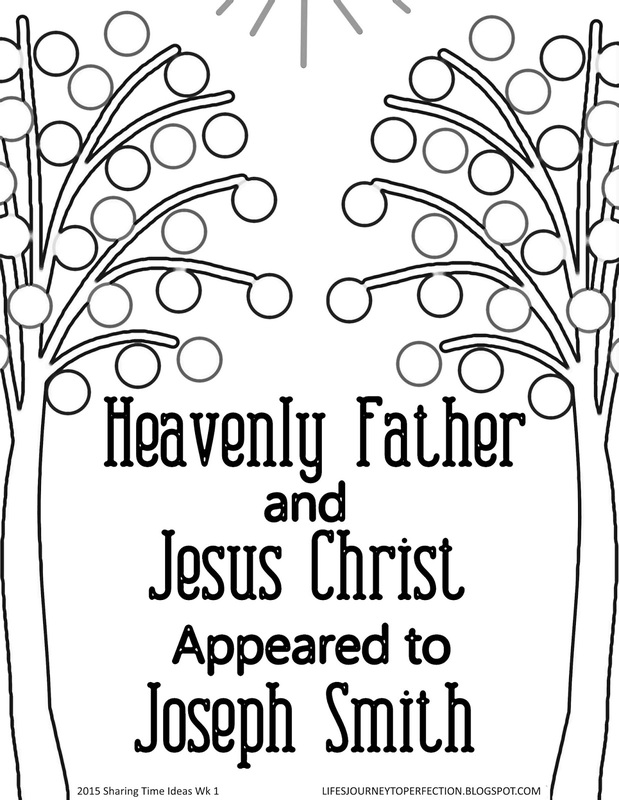 Heavenly Father and Jesus appeared to Joseph Smith. Joseph received the answer, that he should not join any of the churches. Later The Church of Jesus Christ of Latter-day Saints was restored to the earth, through the Prophet Joseph Smith. Along with the keys of the Priesthood. When discussing the story of the First Vision, point out that Joseph Smith was only the age of some of the young men in the ward. Invite them to think of someone in the ward who is 14 years old. Show the week's theme poster and invite the primary children to repeat with you, "Heavenly Father and Jesus Christ appeared to Joseph Smith." Have an object such as a stuffed animal or a ball. Invite the children to sing the 3rd verse of, "On a Golden Springtime". Have one person hide the object and another person have to find it. As the person finding it is far from the object everyone sings quietly, as the person gets closer to the object then they sing louder. Share your testimony the Heavenly Father and Jesus Christ appeared to Joseph Smith. Is it possible to put a picture up for coloring? Say the above but in black and white with the tree and leaves defined but with no color? It's OK...I just printed the one from lds.org so you don't have to go to all that extra work. I appreciate your blog very much.